Many of you, I’m sure, will have decided not to wait until the end of this month to get your hands on the Nexus 5. Besides the fact you don’t have to wait as long, ordering it direct from Google Play will almost certainly be the cheapest way to get hold of your next “Pure Google” device. 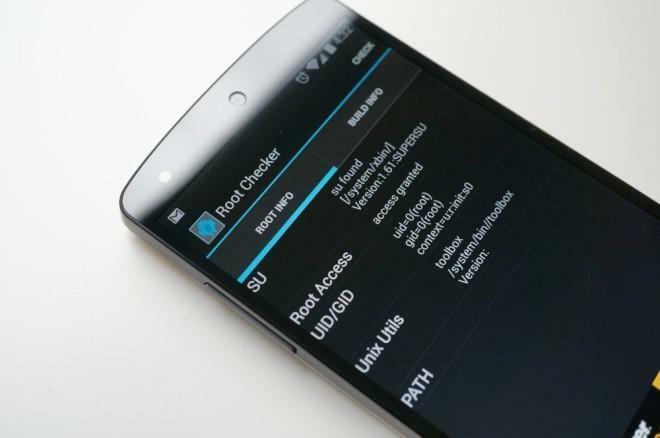 For those of you who have already got one, and are keen on rooting it to please your inner hacker, Chainfire over at XDA Developers has published an easy guide on how to root your Nexus 5. It must be stressed, this is the CF-Root, specifically for “rooting beginners”, or those who don’t want to stray too far from the comfort zone of stock Android. Be sure to thank the developer or donate to him if you like his work. Warning: As with any rooting procedure, this comes with its risks. It’s unlikely to happen, but it can damage your device and invalidates your warranty. Once downloaded, extract the file and save it to your computer’s desktop (or any other familiar folder/file). Power down your Nexus 5. Boot your device in bootloader/fastboot mode by holding down a volume button and the power button to turn it on. Go to the folder where you placed the .zip file, then run the appropriate program. For Windows, that’s the “root-windows.bat“. For Mac OS X it’s “chmod +x root-mac.sh” then run “root-mac.sh“. For Linux people it’s “chmod +x root-linux.sh” then run “root-linux.sh“. Once you’ve gone through those steps, you should see the program doing its thing, and you’ll se a red Android on your phone’s screen. That signals you’re done, and your Nexus 5 is rooted. Nexus phones come unlocked to begin with. Nexus phones are carrier unlocked, but they’re still bootloader locked. The command to unlock the bootloader is simple, but it is locked out of the box. Running these third-party scripts can make the process simpler but it’s also important to understand the security tradeoffs of having a rooted device. Also realize that it’ll wipe all data on your phone as a security precaution. Will I be able to receive an OTA updates if I’ll root my phone? And if I will, would the phone stay rooted after updates? Thanks! You’ll be able to receive updates if you haven’t altered system files, but you might not retain root after an update. Unlocking the boot loader will wipe your phone. Just so you can’t say you weren’t warned! What’s the advantage of rooting a stock Android phone? Tweaks to the system; kernel, system settings, etc. Given, it doesn’t need that many. However, some do make lil changes to make improvements in performance. You can do anything you want with it. You can install custom ROMs, tweak internal settings, change the kernel source, use native backups, install useful apps from the market that require root, etc. What ROM your phone ships with has nothing to do with the potential benefits of rooting it. I see, thanks for the help! Don’t have any time right now to delve into that sort of stuff, I’m just happy I finally have a buttery smooth stock Android phone! You’re welcome. Just an added note though, the reason many people say to root at your earliest convenience, right out the box if possible, is that if you have any desire to do custom stuff later on, you’re going to have to root, and with that you’ll be backing up and wiping everything. It’s not a huge deal, but it adds to the work. The actual act of rooting takes like 5 minutes, and you’ll still have everything stock, since rooting and installing a custom ROM are entirely different things. I was under the impression that rooting your phone (or bricking it) does not void the warranty on a Nexus?! Can You still update OTA without Bricking the device? or is it like jailbreaking where you must un jailbreak (un-root in this case) and then update? In some cases you can but it’ll break your root access. You most definitely will not receive an OTA update if you have a custom bootloader. can someone help me with this question…. I got the nexus 5 and previously had an S3, I used to have insurance on the s3 and never cancelled it. Being that my N5 is an unlocked phone purchased from Google will my insurance not work on it? I’ve asked employees and gotten mixed responses. Anyone with experience have an answer? Cancel it… your insurance probably costs you $8/month with at least $125 to $150 deductible. Do the math… $8 x 24-months = $192 + $125 = $317 which is a little less than a new Nexus 5. Even so, you are still better off just selling the damaged one for parts and buying a new one yourself. If it was a SGS4 or HTC One, that would be a different story. You might want to add the caveat, for those who won’t go to the source link since you posted the instructions here, that this unlocks the bootloader and erases the phone. Very easy! Thanks Google for making these devices easy to unlock. This is why Google is totes amazeballs and Microsoft is evil and deserves to go out of business immediately.